The Hubba NX Solo replaced the MSR Hubba. The setup and take-down is very quick. 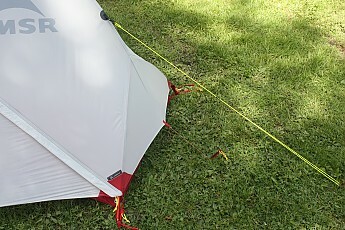 It fits into small awkward tent sites and although seemingly made of light material I found it very sturdy. It is best for 3-season use, although with a couple of mods it can work well in 3 and 1/2 seasons. 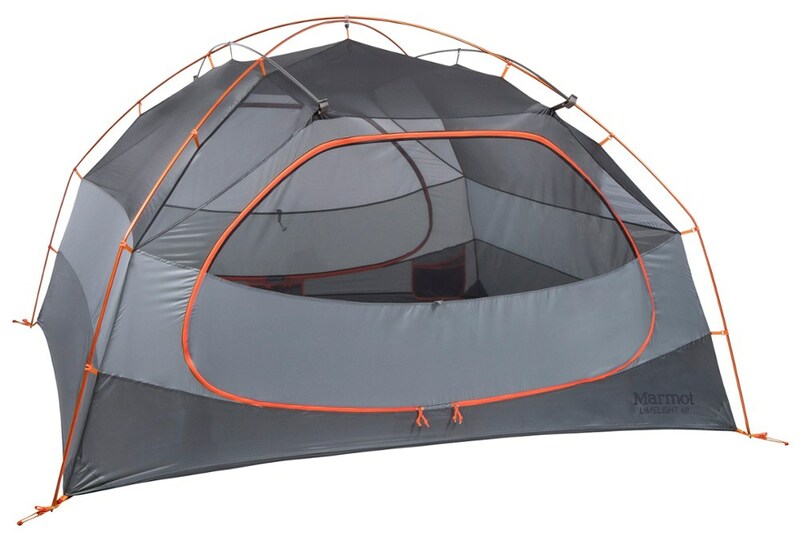 I have no major issues with this tent and would recommend it. No drip-line guy-outs on bottom of fly, at the head and foot ends. 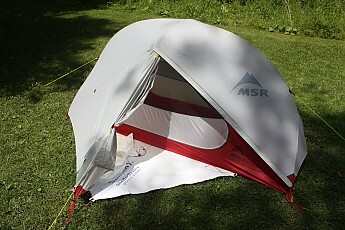 I have always liked this solo tent from its inception years ago, but there were deal breakers. It was too narrow. had too much mesh and had no guy-out points along the main pole. The new 'NX' version has addressed most of this and in addition, has its own unique features. Wider, lower, lighter, higher solid sidewalls, upper covered vent on rear of fly, rain-gutter door on fly, and with re-configured internal space this is a sweet little tent. The materials, although light, work just fine if handled normally, but be careful with the mesh netting. It is a bit fragile and you could get runs as I've heard in other reviews. I've had no issues as yet. If you are a 'bull in a china shop', don't bother with light-weight or ultra light-weight tents. Color choice and vestibule zipper location are always personal to the user. If you don't like either or both, don't buy it, quit bitchin, be happy. I happen to like both on this tent, nuff said. Personally I find the red floor and grey fly cheerful on dark, dull and rainy days when one is tent bound. The grey fly, while not 'stealth' blends into the surroundings quite nicely. 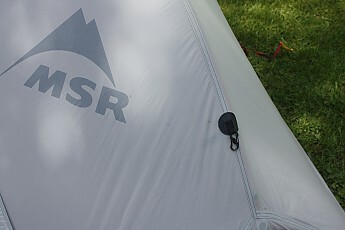 The new higher cut sidewalls give protection from breezes blowing thru the tent (dust, snow etc) and is a godsend for people who have to mess with contact lens solutions like me. Does it keep you a little warmer, slightly maybe. The front and rear of the fly have built in guy-outs higher up than the ground level stake-out loops and give more stability in high wind. Vestibule stake-out loops and guy-lines are connected to ground stakes by an elastic tension loop. This always keeps the fly taught as the nylon tends to expand and contract (sagging) when subject to rain, condensation, and humidity/temp. changes. Have been doing this for near 40 years, it works. Speaking of guy-outs, I have added two to the main pole about a 1/3 of the way up. They also have velcro tabs under the fly for direct connection to the main pole. This will help during more severe weather, in late Fall and early Winter. They have worked great in some high wind and rain conditions this year and when all four are deployed the tent is rock solid with very little movement. I used 1.8mm hi-vis yellow spectra cord (strong, no stretch when wet) and mini line-locs supplied by Z-Pack. All tent stakes have been drilled and a yellow Spectra loop attached for two purposes, easy to extract and easy to locate. In addition I have two more pull-out loops at the bottom of the fly, head and foot. When deployed they move the drip-line out and away from the exposed floor ends in rainstorms and again, they do work surprisingly well. The ring and toggle plastic hardware for the door tie-backs are very fussy and awkward to engage/disengage. I cut the hardware off, leaving the red fabric loops. To the inside loops I attached a small hook, roll up the door and hook into the outer loop, all done in a millisecond. I also added a gear loft and a clothesline, all ultralight stuff. The original weight of only the tent, fly, and poles was 2lbs 7oz right on. The new weight with mods is 2lbs 10oz., not ultralight, but light enough. I didn't include stakes, cord, stuff sacks , etc. as they vary weight- wise from user to user. This is my 3 and 1/2 season tent. 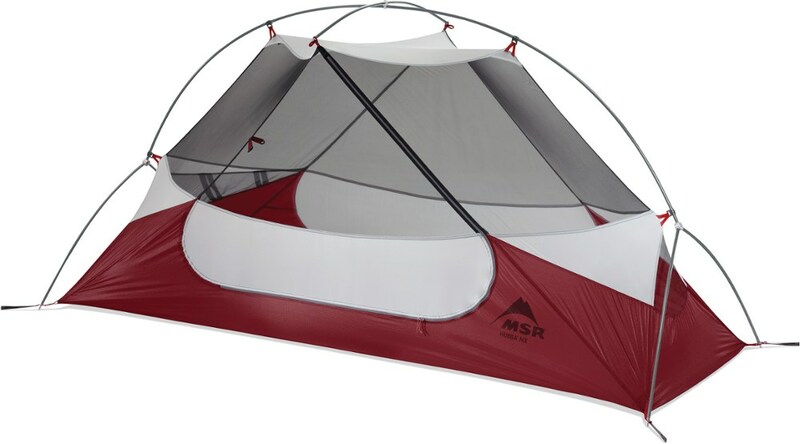 (My winter tent is a Tarptent Scarp 1 with the solid interior and the extra crossing poles). 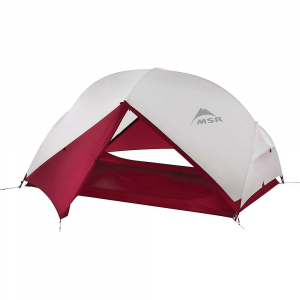 MSR has a greatly improved solo tent now. I do not hesitate to recommend it. The mods I did are not really necessary, but I've been a gear-head for over 40 years and like to modify stuff to stretch the envelope. 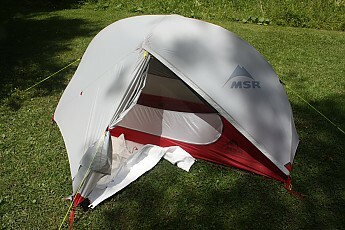 I will add to and/or modify this review as I get more hours on this tent. My next mod is to come up with something to help pitch the fly first and hang the inner (like my Scarp 1) without using a floor saver (too heavy). Great for set-up and take-down in bad weather. This is not unique procedure and a few have already done it. I will 'piggy-back' on their ideas and make something up. I have always used ultralight painters drop sheet plastic for my ground sheet, mainly to keep moisture and dirt off the floor bottom, however it is not puncture proof and was never meant to be. Clearing the tent site solves that issue. 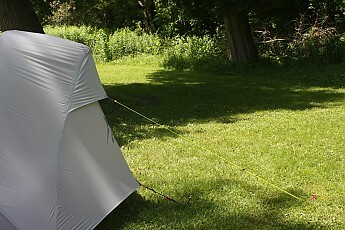 Have never torn or punctured a tent floor in all my years camping. Thank you for reading thru' this. Thanks for the helpful review of your Hubba NX, Jim! 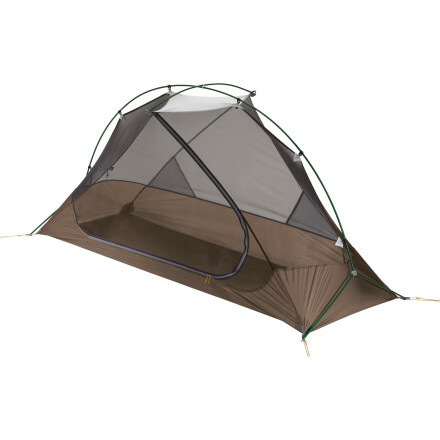 I'd love to see some pics of your tent setup, especially with the mods, in your review. I hope you'll consider reviewing your Scarp someday too. Thanks! Lightweight, quick and easy to set up. Small footprint and fairly low profile. Great for weekend to extended hiking. Withstood wind gusts to 60 Kph. and heavy rain with no leaks while pitched in an exposed location. Previous owner had issues with a pole splitting. MSR replaced under warranty. 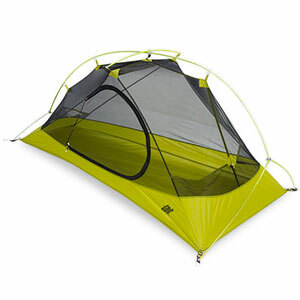 I am a moderately experienced hiker/ camper but this is my first lightweight tent as well as a solo tent. I purchased the Hubba NX used from a person on the Mountain Equipment Co-Op Gear Swap site. 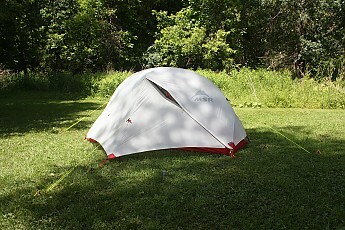 I set the tent up once in the back yard to make sure I had the procedure down before taking it to the woods. After that I did an overnight hike on the Kenomee Canyon Trail in Nova Scotia and have just returned from 8 days on the IATNL. The Hubba NX is very east to pitch and goes up quickly. The DAC poles use a hub system at each end and are symmetrical so they can be flipped end for end with no issues. 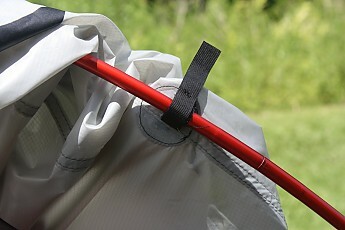 The tent body clips to the pole system with 5 clips. 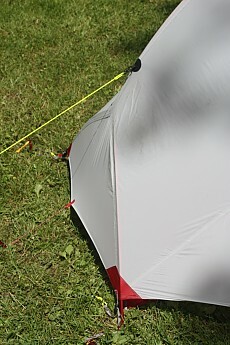 A cross pole at the apex brings the mesh sides out. The pole system attaches to the body at four points with metal clips which the pole ends fasten to. The fly also attaches at these points and the corners are staked out. The fly forms a small, unaccessible, vestibule on the side opposite the door and a good size entry vestibule on the door side. Entry through the vestibule is via a side zipper which has a rain gutter. The fly is also staked out on each side and has additional stake out line attachment points if needed. The fly can be adjusted for tautness at the attachment and stake out points. On the IATNL we weathered strong wind gusts and heavy rain during a thunder and lightning storm with no issues. The Hubba NX stayed put and I remained dry. 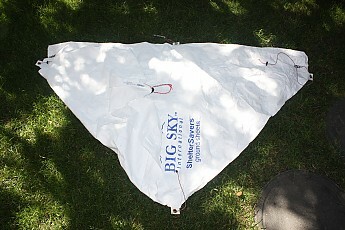 The tent came with the ground sheet which I have always used. 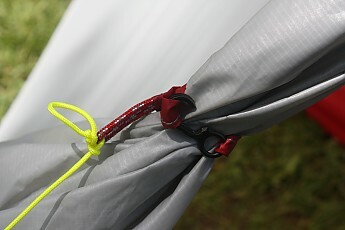 It helps to protect the tent bottom from wear and kept water from soaking through. 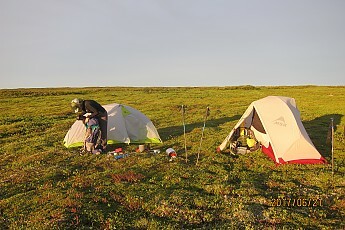 A couple of places we camped were basically like a big sponge as the ground was saturated. No issues. On the windy nighty with the fly buttoned up I had no condensation issues. The fly does have a small vent on the side opposite the door entry. This can be propped open. 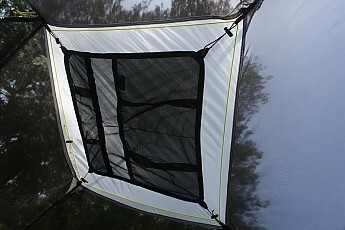 The one night with no wind I did have condensation form on the underside go the fly and drip into the tent. I'm sure this could have been prevented by unzipping the entry door or removing the fly altogether in fine weather. The Hubba NX has a fairly generous amount of mesh for ventilation. 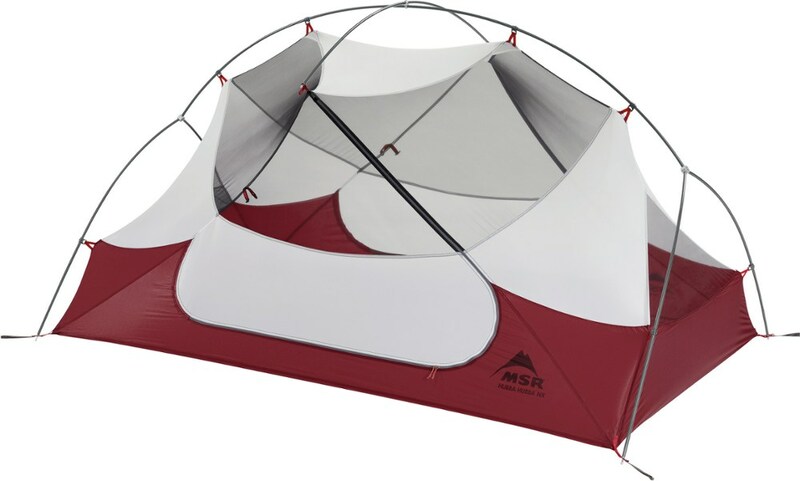 The tent is roomy enough for one person and some basic gear. My Sea to Summit sleeping pad takes up most of the floor area. 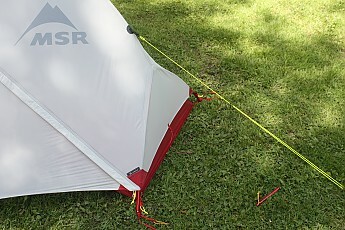 Taller persons may find their feet touching the mesh of the tent. The mesh storage pocket is really only large enough to hold my glasses and cell phone. A gear loft would be a handy addition for other items. The entry vestibule is large enough to store my Aether 70 pack, poles, and boots—so no complaints there. 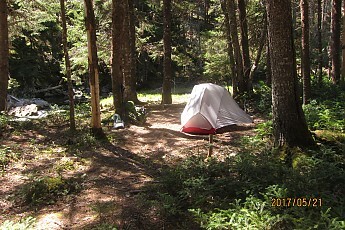 Everything worked as expected and the tent was simple to set up even the first time. 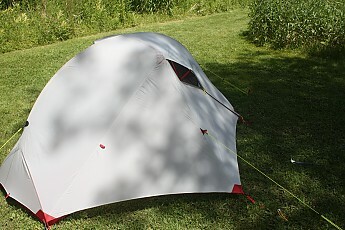 I am used to the heavier tents of the 1980s so this one seems a bit 'flimsy' to me, but has preformed very well so far. Time will tell as to how durable it is. The tradeoff for lighter weight I guess. 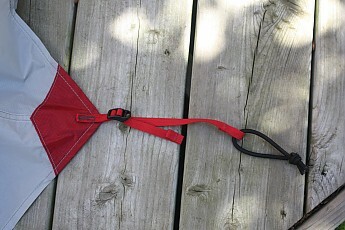 I did tear the stuff sack cinching down one of the straps so will contact MSR to see if they will repair or replace it. All in all I am very happy with the Hubba NX and it has lived up to my expectations so far. Great review and pictures, Earl! Thanks for sharing it and welcome to Trailspace. I hope your tent continues to work out well for you. How was your IATNL hike? Well, it definitely didn't go as planned. We hiked the Grand Codroy Way trail but I developed some really nice blisters on both feet so had to cut our trip short. Beautiful scenery but the ground was saturated making it difficult to keep my feet dry. I plan to return to Newfoundland but will be hiking closer to home for the immediate future. I'm sorry to hear that, but hope it was still a great trip. It sounds beautiful.